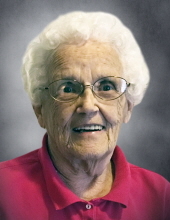 Elaine (McCabe) Van Domelen age 95, of De Pere, passed away October 14, 2018. The daughter of Patrick and Ella (Sullivan) McCabe, Elaine was born August 27th, 1923. She married the late George Van Domelen on September 15th, 1942 at St. Paul’s Catholic Church in Wrightstown. The couple operated the Kitchenette Restaurant and Van’s Market on Broadway Street in De Pere during the 1950s. They later owned a Locker and meat processing plant south of De Pere, Elaine was a supportive business partner to George along with rearing 6 children. After the selling of their business, Elaine worked at the Union Hotel in De Pere where her cheerful smile and genuine caring for people was often noticed. She has been a member of the Altar Rosary Society of St. Francis parish in De Pere. Elaine loved a good book, Irish music, playing bingo and had the gift of caring for plants, flowers and birdlife. Elaine provided comfort in personal and loving ways. She made every family member feel special with a listening ear, a prayer to say, candle to light and her Irish humor ever present to put life into perspective. Her dedication to planned family gatherings and daily prayer for health and well being for others was steadfast. All were welcomed around her table. A living example of loving kindness, she will be missed by daughter, Kathy (Jim Cagle) of Sturgeon Bay, granddaughter Cheryl (David) Modica of Minneapolis, grandson Jerry Van Deurzen, De Pere, and great granddaughter Marina Maney of Milwaukee; daughter Sue (George Binsfeld) of De Pere, granddaughter Tracy (Rich) Kiefert of De Pere, great grandchildren Isabella and Zachary; son John (Ruth Van Domelen) of Glenmore, granddaughter Teresa (Steve Trinkner), great grandchildren Sam, Matthew & Ben; granddaughter Sara (Mike Picard), great grandchildren Henry and Joe and Anna of De Pere, grandson Chris (Gena) Van Domelen of De Pere great grandchildren Claire, George and Eleanore; son Jim (Mary) Van Domelen Lakewood, grandson Andy (Becky) Van Domelen, Reedsville; Rob Van Domelen, Reedsville; & Dane Van Domelen, Baltimore, Maryland, granddaughter Meg (Dan) Hamilton Evansville, WI; son Gary (Karmin) Van Domelen and grandson Sean, Minnesota; daughter Amy (Tim) Houlihan of New London granddaughter Jessica Houlihan, great grandsons Fitz and Orion of Minneapolis, grandson, Patrick (Katie) Houlihan of Winneconne, great grandchildren Benjamin, Charles, and Kerry; grandson Jonathan (Kaitlin) Houlihan of St. Paul, and great grandson Walter; granddaughter Casey Rose Houlihan of New York City. Elaine is survived by; sister Dorothy Vander Loop, Kaukauna. She was preceded in death by her husband George Van Domelen, granddaughter Theresa Van Deurzen, and siblings George (Doreen) VandeHei, Betty & Clarence VandeHei, Rita & Elmer Kerkhoff, Jim & Marilyn McCabe, Bob & Delores McCabe & John (Jack) McCabe. The staff at Rennes nursing home frequently commented on Elaine’s wonderful smile and laughter. Thank you for taking care of our mom. Family and friends may visit at Ryan Funeral Home, 305 N. Tenth Street, De Pere on Thursday, October 18, 2018 beginning at 4:00 p.m. A Prayer Service will close the evening at 7:00 p.m.
Visitation will continue at St. Francis Xavier Catholic Church, 220 S. Michigan Street, De Pere on Friday, October 19, 2018 at 9:00 a.m. A Mass of Christian Burial will begin at 10:30 a.m. with Father Michael Thiel officiating. Burial will be held at Mt. Olivet Cemetery, De Pere. To send flowers or a remembrance gift to the family of Elaine Van Domelen, please visit our Tribute Store. "Email Address" would like to share the life celebration of Elaine Van Domelen. Click on the "link" to go to share a favorite memory or leave a condolence message for the family.